Overview: It’s time to go back to the future with the fifth Showcase Presents volume of the Legion of Super-Heroes. If you have been reading along in real time, it’s been more than four years since DC released Volume 4, so this is a long-overdue return to the teenage heroes of the 30th Century! 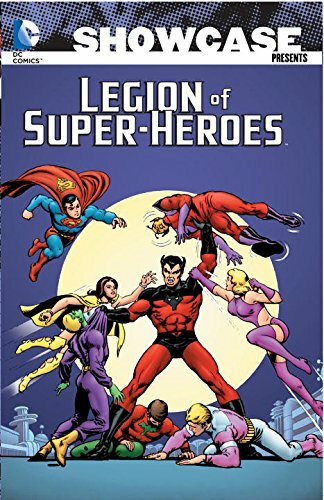 With this volume, we see the Legion stories slowly starting to take over the Superboy title. For most of these issues, the title on the cover reads Superboy Starring the Legion of Super-Heroes. Beginning with issue #231. the title officially changes to Superboy and the Legion of Super-Heroes. The takeover is finally completed in issue #259, as the title officially becomes Legion of Super-Heroes. While we just get two new Legionnaires added to the roster in this collection (ERG-1, quickly renamed to Wildfire, and Tyroc), we see the supporting cast and ancillary characters start to develop. While some of these may seem like throw-away characters, talented writers such as Paul Levitz and Geoff Johns have been able to mine these stories years later and bring these characters back to prominence. For example, in Superboy #218, Cary Bates introduces a character by the code-name of Earth-Man. We don’t see this character for 30 years before Johns brought him back as the main for during his Superman and the Legion of Super-Heroes arc in Action Comics (well worth a read!). Replacing Cockrum was Mike Grell, whose first published comic book work was these Legion issues. Grell brought a new level of detail to the artwork that had not been seen in Legion stories to date. Following his run on Legion, Grell would do memorable work with Green Lantern, Green Arrow, and Jon Sable. Why should these stories be Showcased? : I’ll give you two great reasons why this should be Showcased: Dave Cockrum and Mike Grell. The two artists defined the look of the Legion in the 1970s. Whether it was co-creating new characters, or developing new costumes for the characters, Cockrum and Grell are the key components to the Legion’s success in this era. The story structure remains the same as from previous volumes, but we see the signs that the title is moving towards a more traditional comic with stories carrying over across multiple issues. By all means, pick this up for the art if nothing else. But I think you will enjoy the stories, too. Footnotes: This volume includes the first issue of the Karate Kid solo series. This series ran bi-monthly for 15 issues, and it has not been reprinted in a collected edition. If you like this volume, try: the 2011 Star Trek/Legion of Super-Heroes mini-series from IDW. Written by Chris Roberson, with art by the Moy brothers (Jeff and Philip), the series unites the greatest heroes from the 23rd Century with the greatest heroes of the 31st Century. Most of the senior crew of the Enterprise (Kirk, Spock, McCoy, Uhura, Sulu, and Chekov) find themselves on a planet where they meet a squad of Legionnaires (Cosmic Boy, Saturn Girl, Lightning Lad, Brainiac 5, Chameleon Boy, and Shadow Lass). After the obligatory skirmish between the two groups, they unite to work together to battle a common set of enemies, Q and Vandal Savage. The main covers for the series were done by Phil Jiminez, but the variant covers were done by legendary artists long associated with the Legion, such as Mike Grell, Keith Giffen, and Steve Lightle, among others. This has been collected as both a hardcover and a trade paperback, so it should be relatively easy to track down a copy. And while this isn’t a perfect story – and most media crossovers are not! – the Star Trek/Legion of Super-Heroes mini-series is a fun read. This entry was posted in DC Showcase Presents, Legion of Super-Heroes and tagged Cary Bates, Dave Cockrum, Jim Shooter, Legion of Super-Heroes, Mike Grell, Paul Levitz, Ric Estrada. Bookmark the permalink.